Here are 13 of the most popular electric griddle recipes. Using an electric griddle to cook is fast, convenient and saves energy. Rather than using your stovetop or oven to cook, pull out that little used electric griddle and make some magic! Don't forget to also check our best electric griddle buying guide. The first recipe I have for you is by far the most creative! Cut in shortening and mix until the mixture is a "mealy" texture. In a separate bowl, beat eggs and then add milk, blending the ingredients together. Add egg mixture and raisins to flour mixture. Stir until all the ingredients are moistened and dough holds together. Roll on a lightly floured board to 1/4 inch thickness. Cut with a 2 inch round cookie cutter. Heat griddle until a few drops of water dance on it. Oil griddle lightly and put cookies on it. When the bottom browns, the top will become puffy. Then, turn the cookie over to brown the other side. 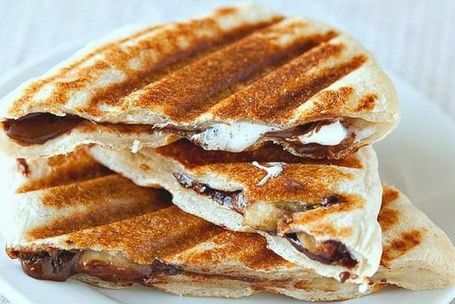 Another great dessert recipe to cook on an electric griddle is a Chocolate, Banana, Marshmellow Panini. Hibachi-Style Mixed Vegetables is an Asian-inspired dinner that is quick and easy when cooked on an electric griddle. Recipe from What's For Dinner at Casa Dandelion? 1 pkg sliced mushrooms, about 5 oz. Heat the oil on the electric grill over medium-high heat. 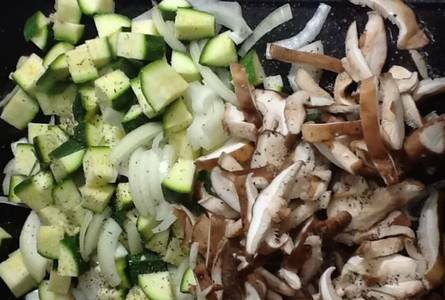 Add zucchini, onion, and mushrooms then season with salt and pepper. Grill, turning frequently until the onions and zucchini are tender and slightly browned. Stir in the butter and soy sauce, cooking until the soy sauce begins to caramelize. Remove from heat and keep warm until ready to serve. Grilled Burritos on the electric grill are great and very yummy! Put the burritos together by spreading a 1/2 C of the cheese, 1/2 C of rice and, 1/2 C of meat in the center of each tortilla. Fold in the sides, then roll up. 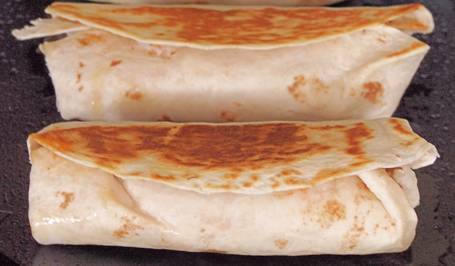 Brush each of the burritos with olive oil, then place on the griddle, seam-side down. Grill each side for 5-6 minutes, or until browned and crispy. Best served with sour cream, salsa or hot sauce. When thinking about what to cook on an electric grill, pizza was never something that I would have thought of. 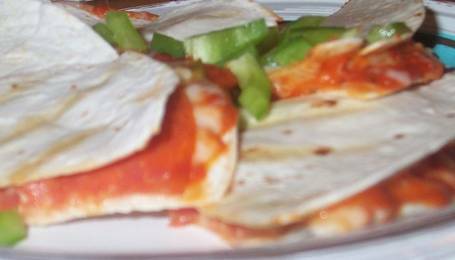 Here is a recipe for Grilled Pizza Wraps. This recipe is found on Genius Kitchen. Heat a large electric skillet to medium-low heat. Spread butter over one side of a tortilla and place it butter side down in the skillet. Spoon a tablespoon of pizza sauce onto half the tortilla. Sprinkle 1/2 cup of cheese over the sauce, then top with a few slices of pepperoni. Fold the clean half of the tortilla over the filling and cook until golden on each side. 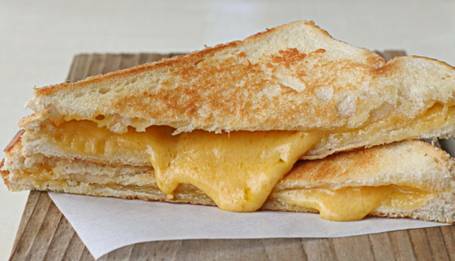 You can't have an electric grill without making classic Grilled Cheese Sandwiches! This easy recipe was found on Kitchen Treaty and I rate it 5 out of 5 stars. Generously slather one side of each piece of bread with your room-temperature butter. Turn the bread over, unbuttered side up. To one piece of the bread, add a single layer of cheddar cheese. Top the sandwich with the second piece of bread, buttered side up. Set the temperature of your electric griddle to about 275 degrees. After the first five minutes, carefully flip the sandwich with a spatula and cook the other side for 5 minutes. Continue to cook and flip until the bread is golden brown and the cheese is nice and melty. Remove the sandwich from the heat and serve as you like. 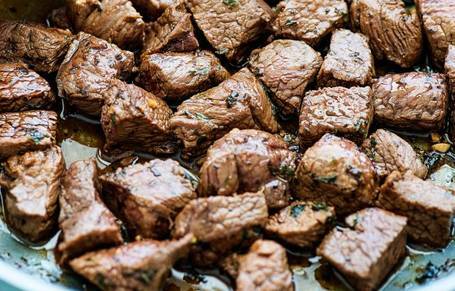 These Grilled Steak Bites are full of flavor and easy to make, I found this recipe on Life in the Lofthouse. Place all ingredients, except steak, in a large ziplock bag and stir with a spoon to combine. Drop in steak pieces and seal shut, then shake gently to coat steak entirely in the marinade. Place bag in the refrigerator to marinate for at least 3 hours or up to 24. Heat a large electric ﻿griddle over medium-high heat. Remove steak pieces from marinade using a slotted spoon and place on hot skillet. Discard marinade. Cook steak according to your desired temperature. 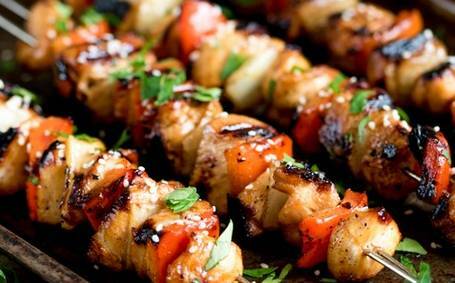 Dust off that electric griddle and cook up some wonderful skewers! Honey Garlic Chicken Skewers is a great electric griddle recipe to start with. This recipe was found on Kitchen Sanctuary.com. Place the chicken in a plastic sandwich bag or a bowl and pour on three-quarters of the marinade (save the rest for brushing on the chicken during cooking). Cover and place in the fridge for 1 hour (or up to a day). When you're ready to cook, heat your electric griddle until it's very hot. Thread a piece of chicken onto a skewer, followed by a chunk of red pepper, then a piece of chicken and a slice of onion. Repeat until you use up all the skewers and chicken. Place the skewers on the griddle, and cook for 8-10 minutes until cooked through. Turn 3-4 times during cooking, and brush with the reserved marinade halfway through cooking. To check the chicken is cooked, slice the largest piece and make sure there is no pink in the middle. 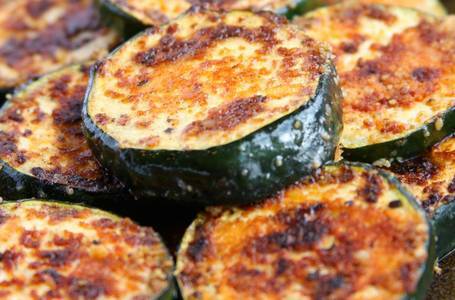 This Grilled Zucchini recipe cooked on an electric griddle will please any vegetarian. I found this recipe on Bite of Delight. 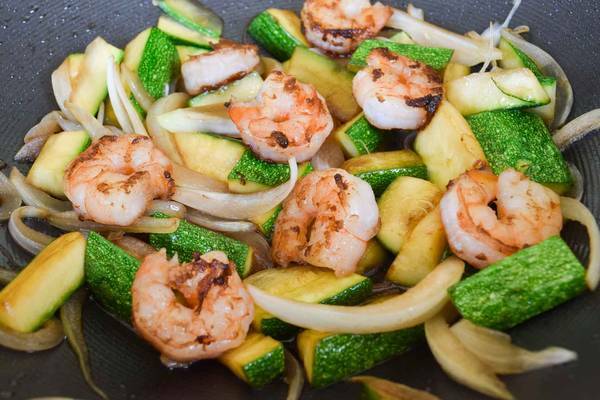 Add a thin coat of butter or oil and place zucchini on the hot surface. Sprinkle on cayenne pepper, black pepper, and seasoning salt. Then sprinkle on parmesan cheese last. Cook for 3-5 minutes, or until browned. Flip and cook an additional 3-5 minutes, or until well browned. Remove and serve warm. This classy appetizer is sure to please any crowd. Griddled Asparagus with Serrano is fresh and easy to make on an electric grill. From the site Chez Le Rêve Français. 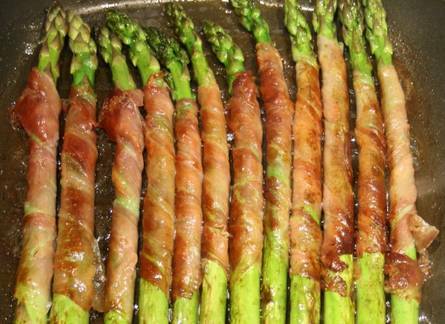 Split each ham slice in two, lengthways, and wind around the asparagus diagonally. Heat the oil and butter in a griddle and add the asparagus for 2 minutes each side. Using an electric grill to cook is not only fast and easy but also, healthier. 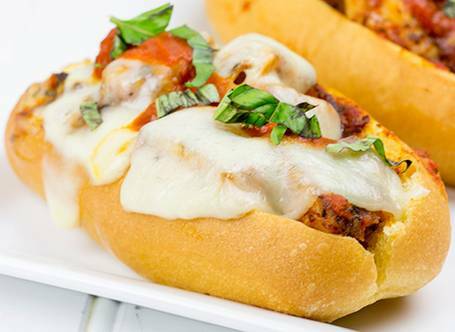 These Grilled Chicken Parm Sandwiches are a new take on a classic favorite. This recipe is from Greatist.com. In a small dish, combine the olive oil, Italian seasoning, and Parmesan cheese. Brush mixture evenly onto both sides of the chicken breasts. Using an electric grill, cook the chicken over medium-high heat until fully cooked. Meanwhile, lightly toast the hoagie buns until the edges start to turn crispy. Transfer chicken to a cutting board and cut into strips. Place strips back on the grill, along with 2/3 cup of pasta sauce. Stir and continue cooking for 1-2 minutes on medium-low heat. Top with mozzarella slices and continue cooking just until cheese is melted. Using a wide spatula, transfer chicken onto hoagie buns. Top with additional pasta sauce and shredded basil leaves (optional) before serving. 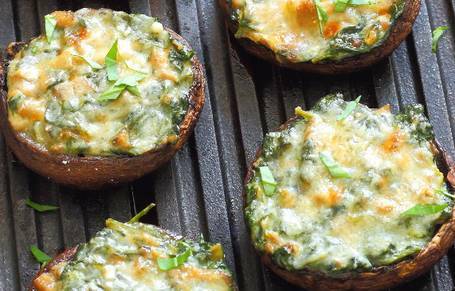 Another great appetizer that I can cook on an electric griddle are these Creamy Spinach Stuffed Mushrooms. Slice of Kitchen Life has this recipe. Remove the stems from the mushrooms and wipe any dirt off with a paper towel. Finely chop the mushrooms stems. In a large skillet, heat the remaining butter, add the chopped mushroom stems and cook for 2-3 minutes. Add the garlic puree, stir and cook for another couple of minutes. Add the spinach to the skillet, stirring to coat the spinach in the garlicky butter. Preheat your griddle to medium/high heat. Spoon the spinach mixture into the center of the mushrooms, sprinkle with freshly grated parmesan and place them on the preheated griddle. These savory Ham and Swiss Griddle Cakes are a great alternative to the classic pancakes, made on an stainless steel electric griddle. This recipe is from the mind of RecipeGirl. In a medium skillet, cook the ham pieces until they begin to brown then add the onion and continue cooking until the ham is nicely browned and the onion is soft. 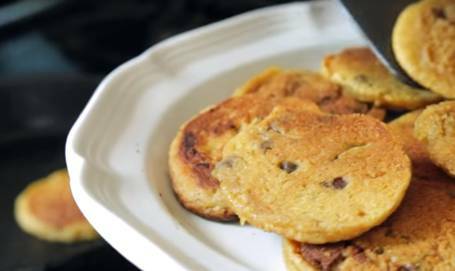 Scoop out a heaping tablespoonful of the ham mixture for topping the griddle cakes upon serving- set it aside. 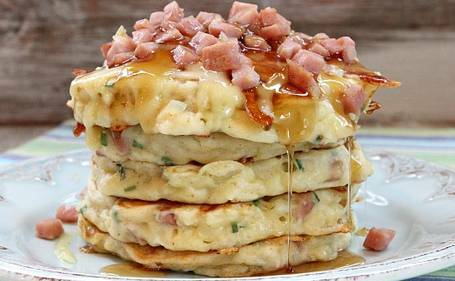 Scoop out a heaping tablespoonful of the ham mixture for topping the griddle cakes upon serving and set it aside. In a medium-sized bowl, whisk together the flour, chives, baking powder, salt, and pepper. Stir in the milk, egg, and oil until combined then stir in the ham/onion mixture and 3/4 cup cheese. If the mixture is too thick, you can add some more milk to get the desired thickness. Heat a griddle and spray with nonstick spray. Pour 1/4-cup of the batter onto the griddle and cook until it is golden brown, about 3-4 minutes, then flip for an additional 2 to 3 minutes on the other side. Repeat with the remaining batter. Serve stacks of 2 or 3 topped with an additional sprinkle of Swiss cheese (optional) and warm maple syrup.